He found this recipe from a website and gave me this link. 1. 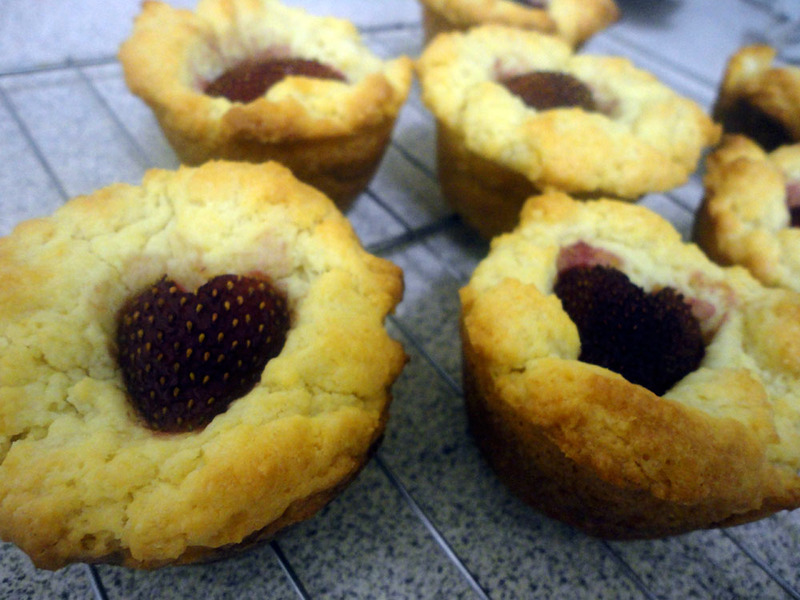 In a large bowl, sift flour, sugar and baking powder together. Add butter cut up in cubes. Blend the butter and flour mixture well using a pastry blender or if you know how to do it using two knives, please show me how to do it because I don’t know how to. My pastry blender does the job for me. 2. Add the cream all at once until mixed well and mixture is moist. It should look like a batter and not a dough. Let it sit while you prepare the strawberries. 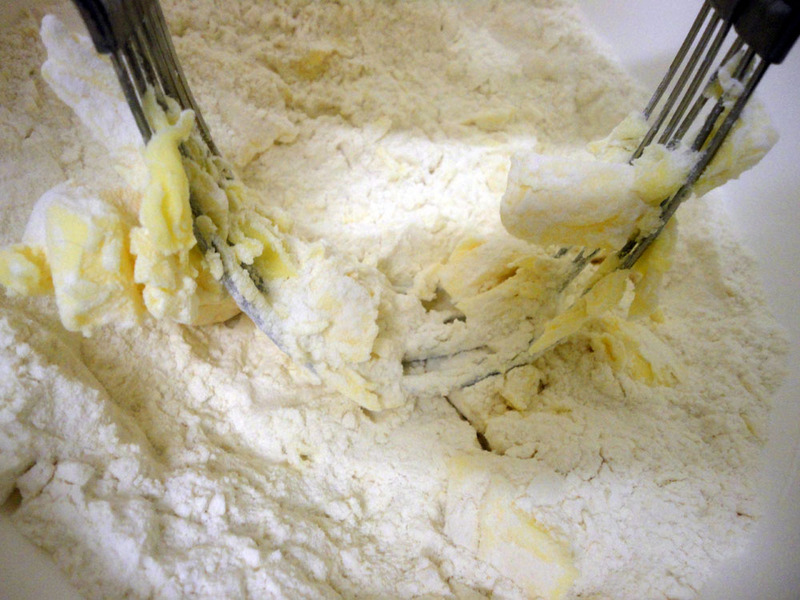 Use a pastry blender to mix butter and flour mixture. Texture will be like that of breadcrumbs when mixed properly. 3. Preheat oven to 220C degrees. 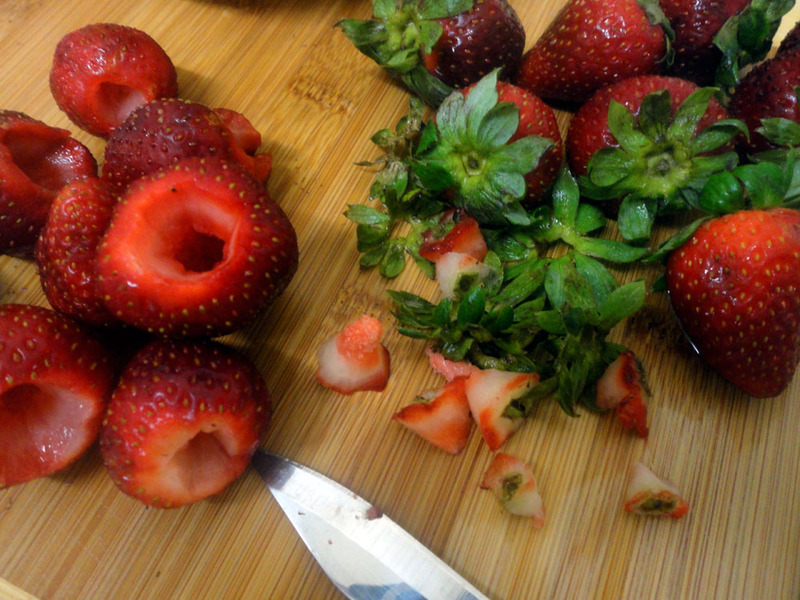 Rinse strawberries and choose 8 with pointy tips for your hearts. Cut the remaining berries into quarters and mix with the remaining sugar. 4. 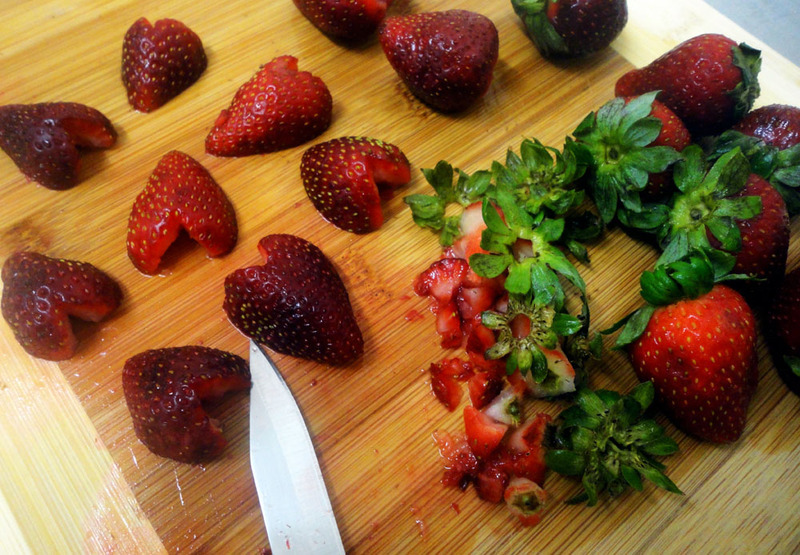 For the strawberry hearts, pull off stem and carve out the pit with a paring knife. 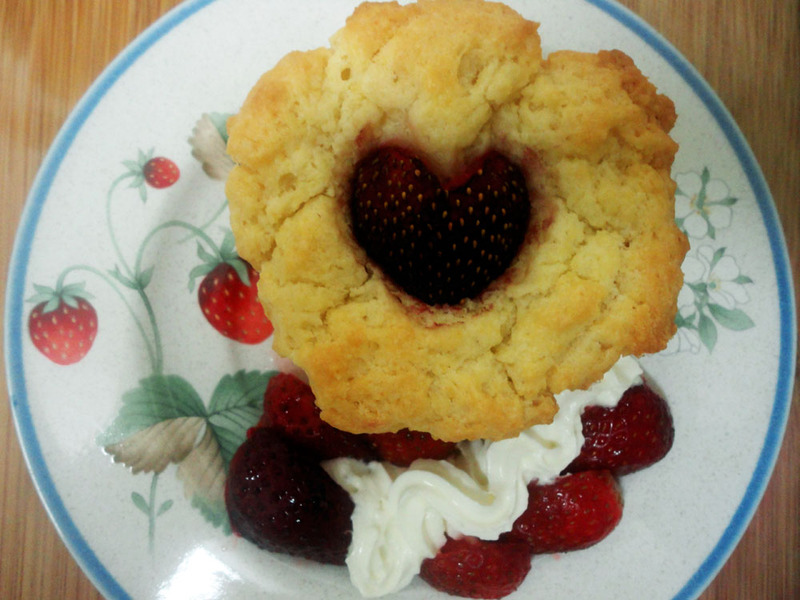 Slice in half and cut a V shape at the notch to create a heart shape. 5. 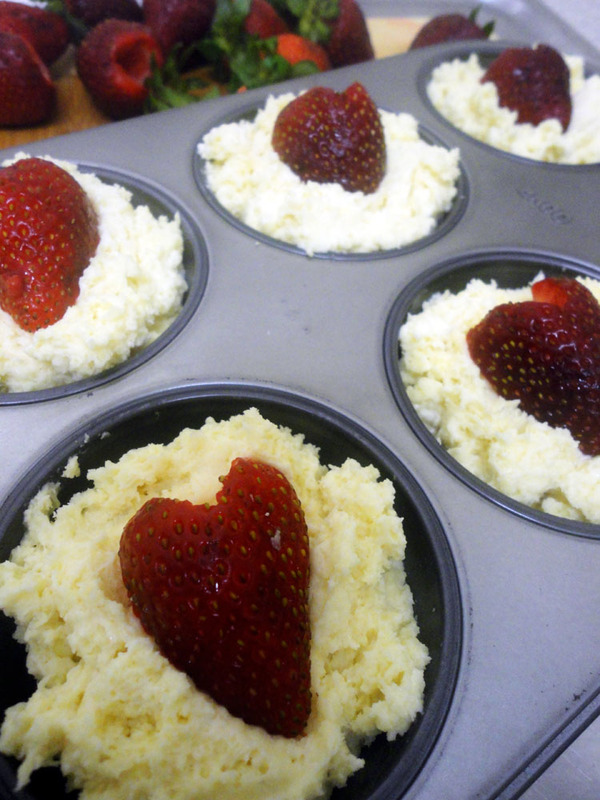 Scoop two heaving tablespoons of batter into each spot of your muffin pan, then press one of the strawberry hearts into each. 6. The recipe link says to bake them for 12 minutes. Oven temperature varies so check for doneness after 12 minutes. I baked the cupcakes for 25 minutes. Let them stand in pan for a few minutes then transfer to a wire rack to cool. 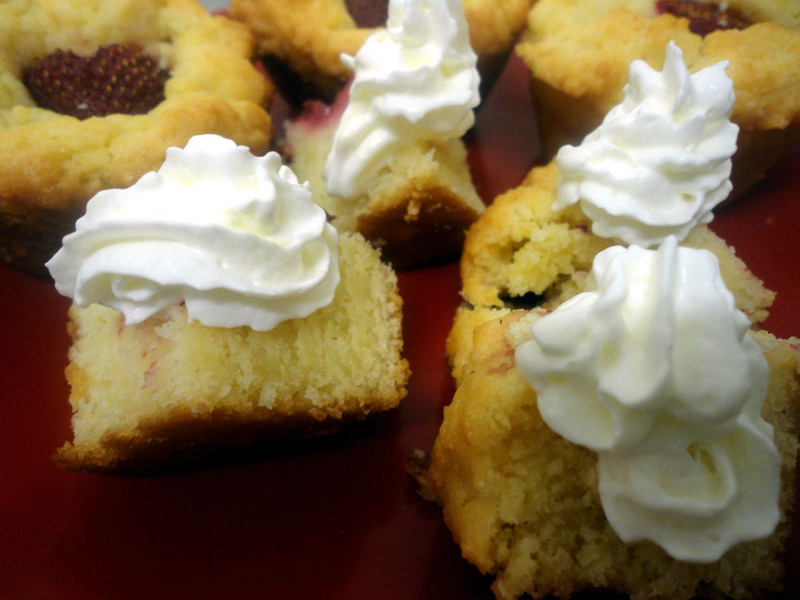 Serve each cupcake with the whipped cream and sugared strawberries. And this one is for you, my friend! But me, I like it served this way. Bite size and topped with cream. 26 Feb	This entry was published on February 26, 2012 at 5:12 pm. It’s filed under baking, cooking, food, recipes, Sweet treats and tagged Baking powder, cake flour, Cream, Cupcake, Flour, flour mixture, fresh strawberries, pastry blender, rainbow cake, Tablespoon, Valentine, valentine s day, Valentine's Day, Whipped cream. Bookmark the permalink. Follow any comments here with the RSS feed for this post. That is so cute! I think my kids would love those. Thanks for the recipe! You’re welcome 🙂 Very nice served with the sugared strawberries and whipped cream. These look delicious! I’m definitely going to try this recipe. Great job. Love the fresh strawberries. Looks yummy AND cute – perfect combo! !